At last, a sensible Christmas exercise programme to burn off the calories after that third helping of pudding, and then all the post New Year parties! If you’re over 25 you might want to take it easy at first, then do it faster as you become more proficient. It may be too strenuous for some. That’s enough for the first day. Have some chocolate. London: January 15th 2005 – 12 noon until 10:30pm the daytime in Trafalgar Square, and the evening in the Somerset House courtyard, read the press release. The Russian Winter Festival kicked off at ten past noon when Ken Livingstone arrived and chatted in the press area with the television crews..
Today, the world famous Trafalgar Square was the site of London’s first Russian Winter Festival. 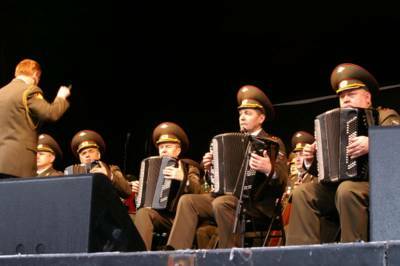 This public event, was organised by the Russian British Cultural Association (RBCA), it was the largest of its kind to ever be held in London. It drew on popular imagery and positive associations with Russian culture from art, history and sport, and made a huge impact on the British capital, with a resonance far beyond Trafalgar Square itself. The festival was timed to coincide with Russian ‘Old New Year,’ which is celebrated in mid-January according to the calendar used in Russia prior to the revolution. It built on the success of concerts that RBCA held on London’s South Bank in January 2003 and 2004, but for this years event the organisers worked closely with the Mayor of London and took the event to a much wider audience, with free access to members of the public. A colourful line-up of well known musicians mixed traditional folk and contemporary pop influences, and appealed to young and old alike, it thus maked the festival an ideal family event. The show “proper’ started at about twenty to one with a welcome from Sadie Nine Although Sadie is Russian – and was a famous singer over there, she has made London her home, and appears on BBC London Radio, Mondays to Fridays between 2am and 6am. The other compare was Alyana Borodina of Russian Radio who, in turn, introduced Ludmila Shvetsova, Deputy Mayor of Moscow and Ken Livingstone. Ken told us that he meets up with Ludmila two or three times a year with the objective of persuading Russian international business to make Britain their European headquarters for business within the EU. Ken then welcomed the British and Russian WWII veterans sitting centre front. Excerpts from this show will be broadcast to Russians back home who have shown great interest in the trip. Ken made a big thing about Putin re-nationalising the Oil and gas industry in Russia and said he would like to re-nationalise the railways in the UK. Ludmila thanked Londoners for coming to the festival and said the troupe would give we Londoners a warm Russian welcome. The first performance of the afternoon was the “Alexandrov Red Army Choir’. This legendary Alexandrov song and dance ensemble was formed over 75 years ago by conductor Alexander Alexandrov – who also composed the Soviet and Russian anthem. Originally a modest group, the ensemble evolved into a huge choir and choreographic troupe. Its vast repertoire includes about 2000 pieces, ranging from folk and church music to choral classics by Russian and foreign composers. The choir were very rousing and sang more than a few marching songs. This show also performed last night at the Guild Hall. The next show was at a quarter to two and were “Severnoye Siyanie’. Severnoye Siyanie was formed in 1957 and is dedicated to the many peoples of Russia´s northern regions, their language, their music and their way of life. A representative of the Institute of Northern Minorities in St Petersburg, they study the rituals of art, sculpture, music and dance of the Eskimos, Chukchi (from the Far East of the nation), Koryak, Yakuts, Evenov, Nanaitsev, Khandov, Mantis and many others. Before I learned of this I felt I was listening to Red Indiats dancing in America. ‘Old New Year´ The history behind this holiday helps to explain the special importance of this time of year for many Russians – I have included a short description of this in the footnote below. “Karagod”; “Faizi Gaskarov Ensemble”; “Makhmud Esambaev Ensemble”; “Loika”; “Natisk”; “Pelageya”; “Krinitsa”; “Nadezhda Babkina and Russian Song”; “Umaturman”; “GLUK’OZA2”; “Tancy Minus”; “Diskoteka Avaria”. Later on, around half past eight to nine o’clock we all made our way to Somerset House and were treated to some brilliant Russian Ice-Skating. The day finished ten and a half hours after it had started. A long day I have to admit. Then there is the northern raised section! Note the huge television screen. ‘Old New Year´ The history behind this holiday helps to explain the special importance of this time of year for many Russians. New Year´s Eve is celebrated on the 31st of December, as it is in the UK, but is followed by Orthodox Christmas on 6th January and ‘Old New Year´ on the 13th. Old New Year´s Day corresponds to 1st January on the Julian calendar, used in Russia before 1918. The difference between the Julian (old Russian) and Gregorian (European) calendars was 13 days, and after the government adopted the Gregorian version, Russians have the opportunity to celebrate New Year twice.